Double your fun on the Bay with this Sail ‘n Jail package! Join an exhilarating Bay Cruise and add a separate trip to world-famous Alcatraz! WEAR Warm jacket and soft-soled shoes. 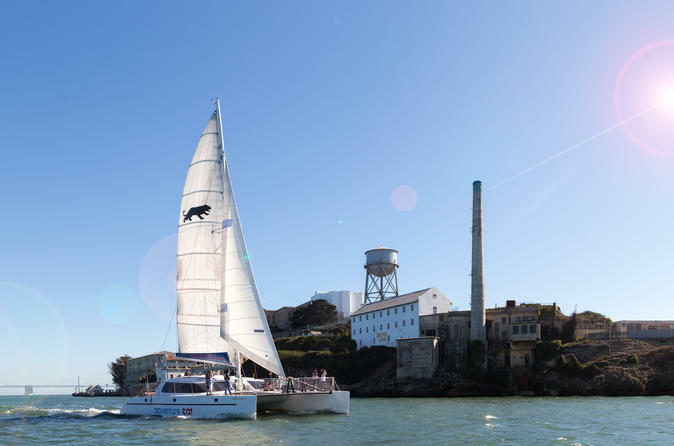 INCLUDED 90 min Adventure Cat Bay Sail, 1 Ticket to Alcatraz Island (face value $38.00), Audio Tour in English, French, German, Italian, Mandarin, Korean, Portuguese and Spanish (bring your own headphones). First and Last name as if appears on the passport/ID of each guest must be provided in order to secure tickets. Children 4 years of age and younger are FREE but must provide name and age so we can make note of it. Alcatraz Tickets are to be picked up at Pier 33 the day of your trip. .